Still looking for a Calendar for the new year? 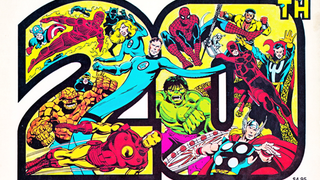 Never fear - you can simply reuse a Calendar from 1981, like this gloriously retro 20th Anniversary one from Marvel. Thanks, Gregorian Calendar! You see, the way Gregorian Calendar works is that each year is 365 days - 52 weeks plus one day. Over time, that one extra day adds up, so we get a pattern where every few years, the days and dates match up. It's usually in a repeating pattern of ever 6, then 11, then 11 again, and a repeating pattern of every 28 years for leap years - so 2015 shares the same dates with 2009, 1998, 1987, 1981, 1970, and so on. Let's party like it's 2015 1981!